The Matrix Solutions team is heading to the Folio:Show in a few weeks to give publishers a taste of Monarch. We're excited to join an impressive list of solution providers to deliver publishers the right technology to speed up the sales process. The Folio:Show has multiple tracks of sessions dedicated to each aspect of publishing. For the sales track they state, "Selling media is more complex (and more rewarding) than ever before." Complex is an understatement. For publishers to be successful they need to sell digital advertising, manage insertion orders, build relationships with clients, provide marketing services and leverage streams of data. That's plenty and hardly a comprehensive list. As the advertising sales process grows more complex, sales teams need a platform to aggregates their vital data into a single hub. There's a lot of moving parts in the workflow and building a hub that connects each disparate piece of data is a must. That's exactly what Monarch does for publishers. 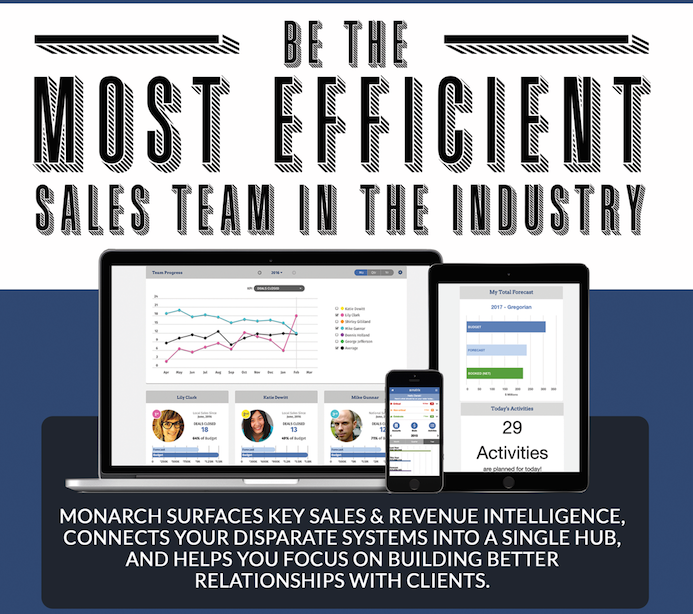 Monarch connects each stage of the media sales workflow together to ease the burden on the sales team and speed up efficiency. Monarch combines best-in-class reporting tools, prospecting features, CRM, pipeline management, budgeting, and forecasting into a single hub. Plus, integration with digital ad networks and proposal tools, Monarch provides a single hub to manage deals, revenue and sales. This frees them up to spend more time building strong relationships with clients and provide a tremendous value. Reporting comes pretty late in the sales cycle. Some sales teams may never encounter a report or need to pull a report until the end of a quarter. But, ignoring reports is like tossing aside a blue print to sales victory. How much does digital advertising really impact the bottom line? Are those deals easier to close? How should you arrange your team to sell multi-channel advertising for maximum revenue? Are you going to meet your budget and revenue goals? What's holding you back? If you fill certain gaps will you hit those goals? How are the campaigns performing? What benchmarks should you be hitting and how can you package this together for your clients? Quality reporting informs a more efficient and strategic sales team. As publishers struggle to do more with less, reporting guides you to better decision making.